Mornings in the 80s and 90s meant a large bowl of sugar to start our day. Today we’re looking back at some of our most missed cereals that have gone to the giant milk bowl in the sky. Finally, I can have ice cream for breakfast and it isn’t sad! 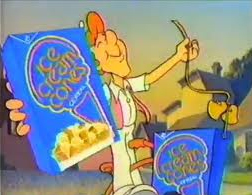 Like all good cereals, Ice Cream Cones had a mascot. This guy was cleverly named Ice Cream Jones, an ice cream man who missed his true calling and ends up selling ice cream-shaped cereal instead. I’m not putting him down though, that cereal was delicious. Puffs flavored in chocolate, vanilla, or chocolate chip represented the ice cream and sweetened cone-shaped pieces that represented… well, cones. 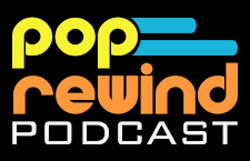 Ice Cream Cones met an untimely demise later in 1987 only to be dragged out and discontinued all over again in 2003. Stop playing with my emotions! At least they didn’t put orange and grape in the same box. Possibly the first and only cereal based on candy comes the Nerds cereal. Like the candy, the cereal box was divided in half, one with orange flavor, the other with cherry. A second grape/strawberry variety was also available. There was even an offer for a cereal bowl that kept the two flavors separate! If only Lucky Charms came in a box like that to save me the work of picking out the marshmallows. Somehow, I’m still undecided for the upcoming election. We once lived in a world where this was a thing. Steve Urkel had his own cereal. Let that soak in for a moment. Urkel-Os were just strawberry and banana ring-shaped cereal bits. Is that a Nintendo sound-alike? Nintendo cereal cashed in on their two most popular franchises: Super Mario Brothers and The Legend of Zelda, each on separate sides of the box. Both sides had fruity/berry-flavored offerings. Way to step up your game there, Nintendo. Who wishes for sprinkles? This gal! Slap sprinkles on just about anything and I will eat it. Case in point: General Mills busted out the sprinkles for their Sprinkle Spangles cereal and I ate that like an over-exaggerated metaphor. This treat was originally introduced in the 1980s, then died, and then was brought back from the dead from 1993-1994 only to be taken out back and shot, Sprinkle Genie and all. The Good News: There may be a way for you to have sprinkles for breakfast again! Allegedly, General Mills’ Sprinkled Cookie Crisp Cereal tastes a lot like Sprinkle Spangles. The hidden treasure is fruit. Oh great. Hidden Treasures was introduced alongside Sprinkle Spangles (and many households in my area received a mini cereal box of each in the mail. Delicious!) Although the two cereals are nothing alike, just because they were introduced at the same time, my brain has always had them in competition with each other. It seems like most people prefer Hidden Treasures, but they’re wrong. Ain’t no sprinkles up in this joint. Hidden Treasures was decent, I won’t lie. The little rectangles of corn were filled with fruit flavors. Were you eating cherry, orange, or grape? Or maybe no flavor at all? Who knows! It was hidden! Way better than making actual French toast. 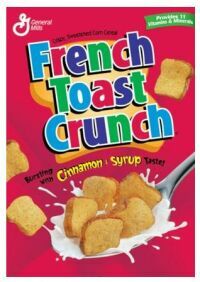 Like the name suggests, French Toast Crunch was shaped like little pieces of French toast at first. Later in the game, General Mills switched from little bread slices to making the cereal visually identical to their regular Cinnamon Toast Crunch. The Good News: Canada does it right! The cereal was never changed in Canada and is in fact still available in the Great White North. Nut n Honey and Fruity Pebbles are tied in first place for relationships ruined due to breakfast foods. Nut ‘n Honey was more of an adult cereal, so while I never ate it, the commercials always stayed with me and I think it’s safe to say that most of you probably remember it, too. The cereal itself was just your standard flakes with honey and nuts fare. The commercials, which could incite divorce, is what really sold it. Triple the taste of Rice Krispies! If you found Rice Krispies boring (and who doesn’t, unless they’re mashed together with some margarine and marshmallows), you probably invested some one-on-one breakfast time with Triples. These weren’t just rice puffs, these were also corn and wheat—all with a sweetly distinct flavor. It was low in sugar, it wasn’t super bright, it wasn’t even that gimmicky. What it was: delicious. Cinnamon Mini Buns: making cinnamon rolls a-okay breakfast fare for over 20 years! It’s hard to believe that Cinnamon Mini Buns were only around for two years. I seem to remember eating them way past 1993, but my mom was never above serving expired cereal. Cinnamon Mini-Buns were rock hard little Cinnabons that you could eat for breakfast. The cereal came back from 2005-2009 as Mini Swirlz. The Good News: As of 2010, Cinnamon Mini Buns and Mini Swirlz are still available under a different name—Cinnabon. Let’s hope we don’t have another 12 year cinnamon bun cereal dry spell. Did we miss your favorite cereal of milk bowls past? Leave us a comment! Good stuff here. I miss these. Cinnamon Mini Buns was definitely around well into at least summer 1994.